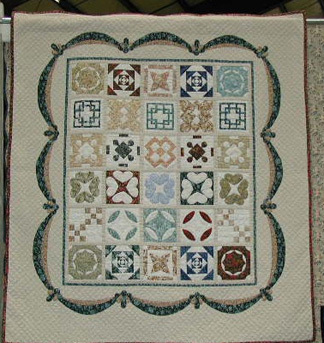 Six members of the Maple Leaf Quilters have been involved in a round robin quilt project involving Dear Jane blocks. Each person selected their own fabrics and put together a box for the project which included fabrics to be used, plus the first row completed. The box also included cut sashing strips or setting triangles, and any other specific instructions from the quilter. Each round involved making a row of Dear Jane blocks -- the rules for each row are listed below, beneath the pictures. UPDATE July, 2000: Our projects are all either FINISHED. 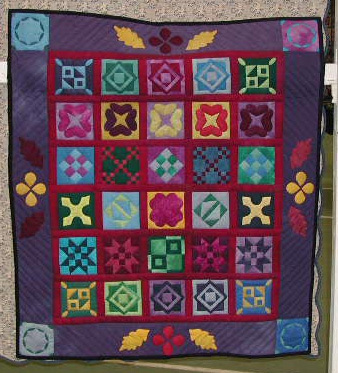 We are very excited that they will be included in the Dear Jane Quilts exhibit at the Vermont Quilt Show. Here are the finished quilts. Photos by Linda Franz at the July 2000 Vermont Quilt Festival, Special Dear Jane Exhibit. Fran choose her own hand-dyed fabrics for her project. Edith chose William Morrison reproduction fabrics for her project. 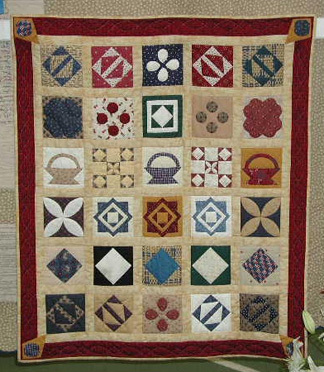 Janis chose an Americana theme for her fabric. 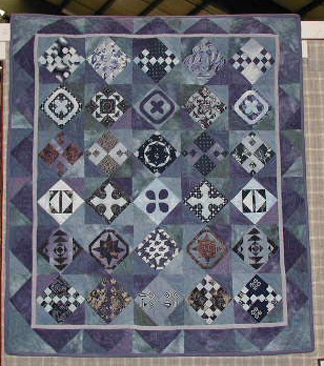 Carol's fabrics include hand dyed blues plus Dutch Wax and Japanese fabrics. Marie chose a wonderful collection of fabrics. Paula is using some of those fabulous batiks from her collection. Guidelines for Dear Jane Round Robin. This project will be based on the patterns from the Dear Jane book. Each person will select their own fabric and will decide which patterns they will use. The project will consist of 6 rows, with 5 blocks in each row. She will also choose her setting design and will add her own sashing—both top and bottom. She will also have all the sashing/setting fabric cut. Row 2 will be next and the gal who has this row may choose any of the 4 remaining options and may add it to the top or bottom of the original row. Row 3 will be from the 3 remaining options and adding it to the top or bottom. Row 4 from the remaining two options; again, adding to either top or bottom. Row 5 will be from the last option, placed on top or bottom. Then . . . you will be informed what to do for the last row, so we’re calling this “TBA!” You will want to be sure you include plenty of fabric, especially if you decide to have your background all one fabric. We recommend 12 to 30 fabrics. The elements of this challenge are the patterns and the balance with the fabric variety. Once a pattern is used it cannot be used again (except within the row of course). For example, you could choose to make the A, B, B, B, A option. The first block in that row could be B4 from page 27. The 2nd, 3rd, and 4th blocks in that row could be E2 from page 49. Then you will repeat B4 for the 5th block. (The next row added will not use either B4 or #2 again.) The 1st and 5th blocks will be the same pattern but should be made with different fabrics. 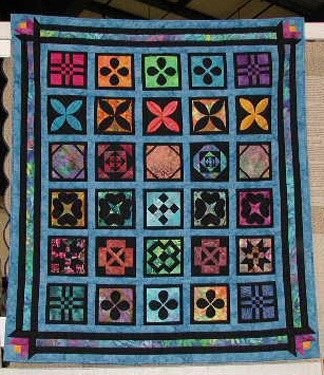 The 2nd, 3rd, and 4th blocks should all be the same but with different fabrics. The turn-around time each row: 2 weeks. 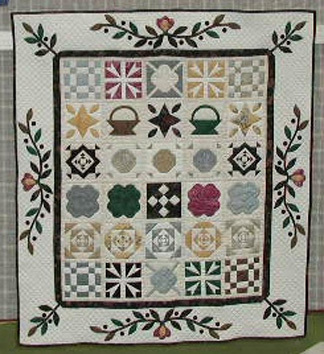 The guideline for the "to be announced" row is as follows: Repeat either the top row or the bottom row and add it to the opposite end of the quilt. Fran Hathaway and Edith Shanholt were the inspirations behind this very successful round robin project, and are the authors of the guidelines here.